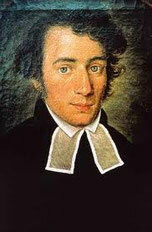 Johann Konrad Wilhelm Loehe (1808-72) was pastor of the village church in Neuendettelsau from 1837 until his death. At the same time, Loehe was influenced both by nineteenth century pietism with its expectation of an active faith and a focus on Lutheran confessionalism as came to expression in the Erlangen theology. From his humble location, Loehe proceeded to have an astonishing impact on church and theology both in Germany and around the world. During his years of primary service as a devoted parish pastor, he simultaneously engaged in the theological debates of his time in Germany and the organization of mission work in North America, among both German immigrants and Native American people. In his ministry and commitments, Loehe held together impulses that today are often considered at odds with one another: liturgical renewal and mission, pietism and orthodoxy. He was a scholar of the historic liturgy, who crafted orders of worship that have influenced the shape of the liturgy both in Germany and North America. Loehe’s focus on the Inner Mission of the church led to the formation of an order of deaconesses and diaconal institutions that have provided sacrificial service to people in particular need to this day. His commitment to Outer Mission meant that he engaged actively in the recruitment and instruction of many sent from Germany to North America to serve as teachers and pastors of the Lutheran church, as well as to lead fledgling efforts in ministry to the indigenous people of this country. Both the Lutheran Church–Missouri Synod and the Iowa Synod (one of the church bodies that eventually flowed into the Evangelical Lutheran Church in America)—and theological institutions that trace their origin to these church bodies, Concordia Theological Seminary at Fort Wayne and Wartburg Theological Seminary at Dubuque—look to Loehe for their origins. 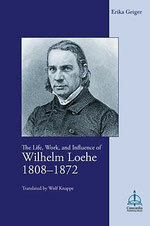 Geiger, Erika, The Life, Work, and Influence of Wilhelm Loehe (1808-1872), tr. by Wolf Knappe, Concordia Publishing House: St. Louis 2010, 296 pp.